Foreign ministers and high-level representatives from the 183 Member States of the Treaty have urged the eight remaining States – China, the Democratic People’s Republic of Korea (DPRK), Egypt, India, Iran, Israel, Pakistan and the United States – to sign and ratify the CTBT, “thus ridding the world once and for all of nuclear test explosions”. The Final Declaration of the Conference on Facilitating Entry into Force of the CTBT adopted unanimously on September 27, 2013 at the United Nations headquarters in New York affirms “the importance and urgency of achieving early entry into force of the Treaty as a crucial practical step for systematic and progressive efforts towards nuclear disarmament and nuclear non-proliferation." The declaration also describes the universal condemnation of the North Korea's announced nuclear tests as "a testament to the normative strength of the Treaty and its contribution to the stigmatization of nuclear test explosions". The declaration argues that the cessation of all nuclear weapon test explosions and all other nuclear explosions, by constraining the development and qualitative improvement of nuclear weapons and ending the development of advanced new types of nuclear weapons, constitute an effective measure of nuclear disarmament and non-proliferation in all its aspects. “The ending of nuclear weapon testing is, thus, a meaningful step in the realization of the goal of eliminating nuclear weapons globally, and of general and complete disarmament under strict and effective international control,” the declaration states. The declaration states that the UN Security Council Summit on nuclear non-proliferation and nuclear disarmament in New York on September 24, 2009, which adopted resolution 1887, and the adoption by consensus of the Final Document of the 2010 Review Conference of the Parties to the Treaty on the Non-Proliferation of Nuclear Weapons (NPT), among other events, demonstrate continued strong international will to see this Treaty brought into force. United Nations Secretary-General Ban Ki-moon, who opened the conference, urged all remaining States to sign and ratify the CTBT without further delay. “This is a call I make on behalf of all people in our world who adamantly oppose the development of those indiscriminate weapons and yearn for a safer world,” Ban said. “History teaches that we have to be diligent in pressing for ratification,” he added, pointing out that the 1919 Convention for the Control of the Trade in Arms and Ammunition never entered into force. Neither did the 1925 Convention for the Supervision of the International Trade in Arms and Ammunition and in Implements of War. “After these setbacks, it took 88 years for governments to adopt another multilateral treaty to control conventional arms transfers, the Arms Trade Treaty. The international community cannot afford anything near this long wait to revive efforts to outlaw nuclear testing if the CTBT fails to enter into force,” Ban emphasized. “The repeated nuclear tests by the Democratic People’s Republic of Korea should serve as a wake-up call that now is the time to act,” he added. He added: "The CTBT is a uniting force in the multilateral system. Today, the prospects for entry into force of the Treaty appear much more positive than they did for many years. It shall be up to you to seize the moment and to determine the action necessary to realize the dream." Hungary was one of the first to ratify the CTBTO. Former CTBTO Executive Secretary Tibor Tóth, who headed the organization for eight-years until Zerbo – who hails from Burkina Faso – took over in August 2013. “The continuing moratorium on nuclear test explosions is important but this is only a temporary measure. It does not ensure the permanent cessation of nuclear weapon test explosions,” Natalegawa added. The recent ratifications by Guinea-Bissau on September 24, 2013 and Iraq on September 26, 2013 which increased the total number of ratifications to 161 were welcomed by States attending the conference. 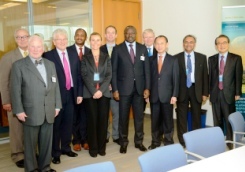 The conference agreed on eleven concrete measures to accelerate the CTBT’s entry into force. These include support for bilateral, regional and multilateral outreach initiatives and cooperation with civil society as well as encouraging a range of other activities designed to increase the number of signatures and ratifications by raising awareness about the importance of the Treaty. The Final Declaration also welcomes the establishment of the Group of Eminent Persons (GEM) on September 26, 2013 to promote the objectives of the Treaty and help secure its entry into force. “The Group will inject new energy and dynamics into the entry into force process,” the CTBTO Executive Secretary said. “As I look to this Group, I am inspired by the sheer magnitude of their experience and expertise. Through their credibility, credentials and experience, I expect the Group to open new paths for the entry into force of the Treaty,” Zerbo said. States commended the effectiveness of the CTBT verification regime as demonstrated on many occasions, most recently in response to the North Korea’s nuclear test announced on February 12, 2013.